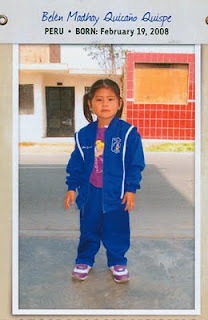 Every few months, I receive the information on a few Compassion children that are in need of a sponsor. These children are not available anywhere else but through me, their Advocate. Right now, I have 14 of these precious children in my care, all of them living in extreme poverty, all of them waiting for a sponsor to call their own. Even though I care and pray for each and every one of these children, and I work hard to find them a great sponsor... this time, I am searching for a particular kind of sponsor for a specific little girl. 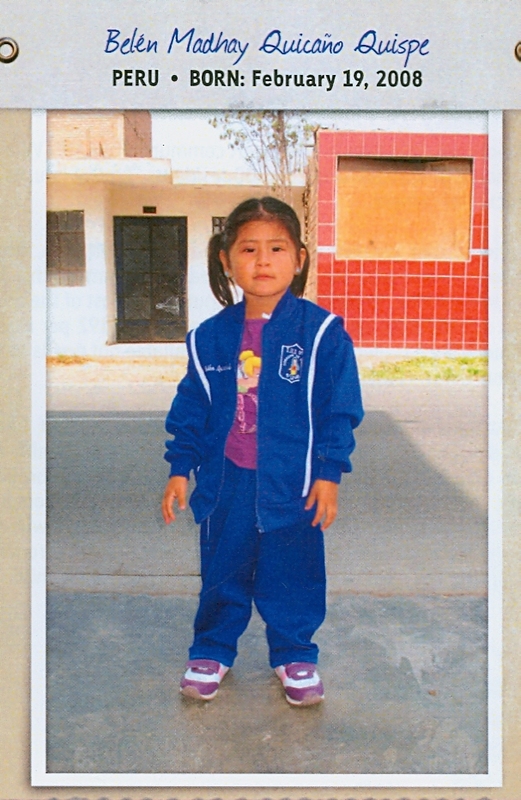 Meet Berling De Los Angeles, a precious 4 year old girl from Nicaragua. Berling helps her family by carrying water, gathering firewood, and running errands. She lives with her mother, and her mother isn't employed. She has two siblings. She loves to play with dolls. The information on Berling is fairly typical, but her photo isn't. Not to me. When I looked at Berling's photo, it hit me immediately. In the first glance, perhaps what struck me the most was the juxtaposition of her pure white bride-like wedding dress against the desolate backdrop of poverty. I am startled to see hair that I would expect to be jet black... I know from when we sponsored Emily that just as Compassion can change a child's hair color, so can poverty and malnutrition. Not only is Belen more healthy in terms of proportionate body size for her age, but Belen's countenance is completely different. ... but I need something more for Berling. I need a sponsor who will be very attentive and proactive, a sponsor who will write faithfully and regularly, a sponsor who will advocate for her and watch carefully for signs that may point to something deeper affecting her health and wellbeing, including the potential that she may be abused. I know that this sounds like a lot to draw from a photo... but there is a reason I feel so strongly about this. 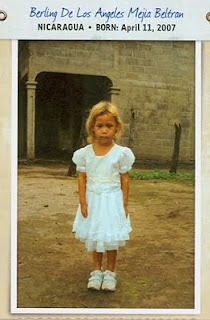 Beyond the photo, there is something heartbreakingly familiar about her. That look on her face, without words, describes exactly how I felt as a victim of child abuse. I could be wrong -- but how many people didn't advocate for me on the chance that they might have been wrong on their suspicions? So many people suspected or knew, and backed away from the responsibility. Even the police. Am I willing to make that mistake with her? NO. 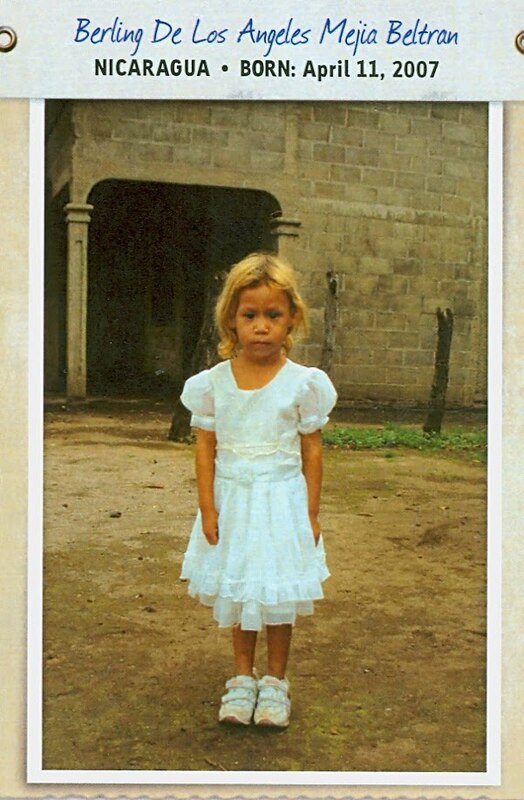 Whether you're already an active sponsor or have never sponsored a child before... if you can see beyond the photo to what I see, and feel a burden on your heart for Berling, please contact me before the end of July. If you are not in Canada, I will have her file transferred to you. I have already committed to another sponsorship this month, so it may very well be that God doesn't intend for me to sponsor Berling, even though I feel so very strongly about her. Perhaps He is simply asking me to advocate for her because of how strongly I feel. Perhaps she will be my 14th sponsorship. Perhaps, you have read this and already know that she is yours. Perhaps, like Michelle's sponsorship of Kwagala (check out the story here! ), the CompassionCan blog family can come together in a group sponsorship of Berling. I don't know yet what His answer is. Our role is to advocate and pray for all children at all times. Beyond that, it becomes a question of whether we will keep praying for them, or whether we will be the answer to their prayers. Once upon a time, there was a man who was known for his appreciation of all-things-gadget. We'll call him Mike (because that's his name, after all), but at work, we call him most-likely to electrocute himself if he fell into the harbour. At any given time, he has a belt that holds a cell phone or two, tools, keys, a pocket knife, and probably a toothbrush, a flashlight and who knows what else. He's tall and very thin, the belt also acts as an anchor so that he won't fly away when there's a decent gust of wind. This week, though, he came into work with an unforgettable story of what NOT to get. 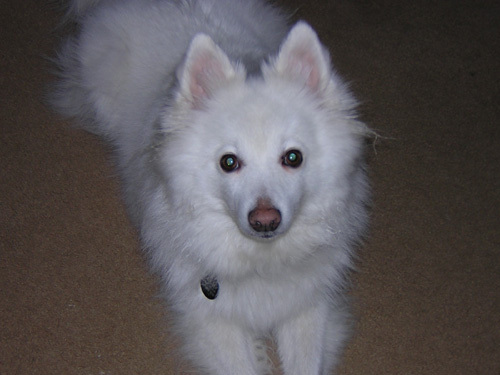 Mike has two beautiful dogs that pretty much resemble fluffballs of teased white fur. Adorable, but all that fur, well.... Mike, being gadget-boy that he is, decided he'd invest into one of those robotic vacuum cleaners, the "Roomba". 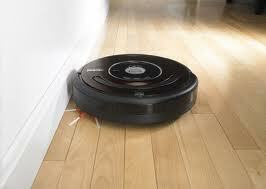 Seems simple enough... let the Roomba do the work for ya. That worked well until a few days ago. Mike was in the shower when he heard the Roomba start it's automatic daily run through the house. He didn't think much of it at the time. Twenty minutes later, when he opened the bathroom door, an unmistakable smell immediately overwhelmed him. ... and that the Roomba, unable to detect "road hazards" and drive around them, proceeded to push and drag the present throughout the entire house. There was literally a trail from baseboard to baseboard, in every single room except the bathroom, since that door had been closed. One thing is for certain -- if you ever wanted to know if a Roomba really does cover every square inch of floor... just ask Mike. He'll tell ya the proof's in the pudding. Uh... well, or something. Without his iron-strength sense of humor, I think he'd be suffering from post-traumatic stress disorder... It took less than 24 hours to clean the mess, but it may take a lifetime to fully recover the sights and smells of that one. He told the story to pretty much everyone at work the next few days. We laughed to the point of tears every single time he retold it. We have been teasing him mercilessly since... "Hey, Mike -- how's that C3-PU robot of yours? I hear it doesn't pick up squat....!" See the pitfalls of technology? If you have puppies, you may want to avoid getting your loved one a C3-PU for Father's Day... just sayin'. I was recently offered the book "Heaven Is For Real" in exchanged for an unbiased review. Heaven Is For Real is the story of a young boy who, in the course of an emergency surgery to save his life, takes an unexpected detour through Heaven. His family hasn't realized his adventure until he began to describe it in bits and pieces over the next few years. His revelations and descriptions lead them to believe that it was unmistakable -- their son had experienced Heaven. Beautifully written in simple language injected with light hearted humor, Heaven Is For Real is a page turner that is read with surprising ease, considering the intensity of the topics discussed. While the book gives no reason for me to suspect it's authenticity, I have little interest in knowing what Heaven will be like. Yes, as a Christian, I'm homesick for Heaven, but until I am Home, my focus is on the path God has placed before me, my only goal is to finish the tasks as He gives them to me. The only thing I need to know about heaven, I already know... Jesus will be there. I can not imagine noticing anything else about Heaven in His presence. The characteristics of Heaven aren't the reasons I seek Him... I seek Him because of His character. Whether Heaven is beyond beautiful and amazing or it is a dirt filled pit of endless nothingness... it only matters to me that He is there. That is sufficient. "Book has been provided courtesy of Thomas Nelson and Graf-Martin Communications, Inc. Available at your favourite bookseller from Thomas Nelson". It's hard to picture ourselves trapped in modern day slavery. Harder yet to picture our children in those heartbreaking conditions. When we consider the children being rescued in Ghana by George and his team at PACODEP, we picture freedom for every one of the children waiting for rescue. On the auction block -- 20 beautiful individual photographs (your choice of 8x10 or 11x14) with the funds going to our Ghana mission trip. Please take a look at these photos -- bidding takes place in the individual photo's comment section! More than anything, your prayers are needed: For our trip, for George and his team, for the children, for our families as we prepare, and for our fund raising efforts. Thank you so much for your support! If you're interested in these photos, but are not on Facebook, simply contact me!